Stacking The Shelves is a weekly meme hosted by Tynga's Reviews. Y'all, I'm uber excited about the books I got this week. Ch-ch-check it out! *My picks for the Top Ten Books To Get Into The Halloween Spirit. *6 Questions with FROM WHAT I REMEMBER authors Stacy Kramer and Valerie Thomas. Find out what the craziest thing they did in high school was. *Wherein I review LOVELY, DARK AND DEEP. Not just a pretty cover. That's all, folks! What did you guys get this week? The One That I Want looks cute. Lots of books this week! Get reading!! Awesome haul!! I loved Easy!! Nice haul. The One That I Want is a new title for me. Great haul!! you brought some pretty amazing books! Easy is SUCH a good book. I really loved it. SO jealous that you met "Patch" (Drew)! WILL WE GET TO SEE PICTURES?! And I really need to finish up Silence so I can get to Finale. 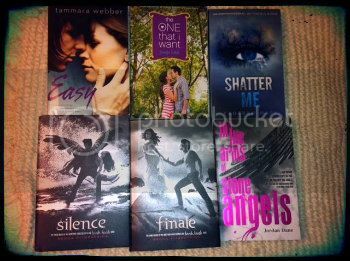 Been dying to read Easy & I def need to finish the Hush Hush series lol! Great haul! !